If your business is growing, you’re doing something right. But what, exactly? And just how much have you grown? Could you be growing better, faster? Without the right reporting, you’re driving blindfolded. It’s crucial to have that insight into where you’re going, what obstacles are in the way, and where the opportunities are so you can steer effectively. But it’s not always easy to get the reports that make the most sense for your business. You may be limited by the data available, or lack the tools that allow for proper analysis and visualization for your specific use case. And what good is your data if you can’t combine it with what you already know, use it to make an informed decision, and take action? 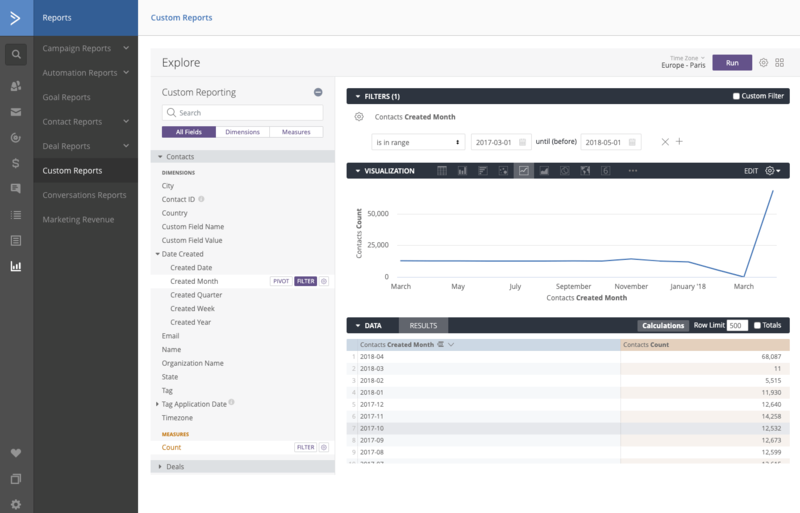 We know how important powerful reporting capabilities are to the success of your business, which is why today we’re thrilled to announce the beta version of Custom Reports in ActiveCampaign. We intentionally developed this new reporting suite with the built-in flexibility you need to discover trends, measure growth, and report on the metrics that matter most to your business. Reports like the Tag Count Report and Sales Performance Report provide a quick summary of your tagging structure and sales leaderboard. Custom Reports lets you dig deeper into that information by providing the flexibility and robust reporting capabilities you need to truly control your reporting. Pull the data you want to see and customize the filtering however you like, to capture the reporting that’s most meaningful to you and your team. See how many contacts have a specific tag and dig into exactly when that tag was added. For example, you can use Custom Reports to learn when your contacts were tagged with “Downloaded Guide,” to get more insight into which customer touchpoints are driving engagement. Quickly see how many contacts have a value for a specific custom field. For example, if you use a custom field to store your customers’ renewal dates, you can pull all contacts with a value for your Renewal Date custom field and quickly understand who to follow up with this month. Build stronger customer profiles off of the data you’re already collecting on them, so you can target the right segments and personalize the customer experience even more closely. Custom Reports helps you gain key insights into your business by looking at data over a specific period of time to see what’s trending. 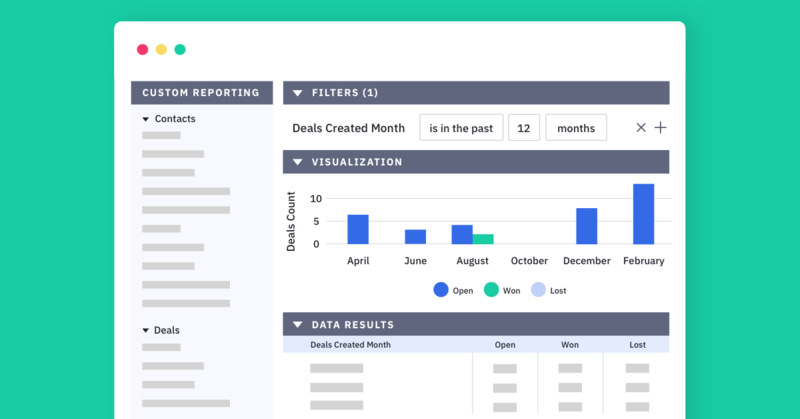 Create visual reports from that data to gain a deeper understanding of how your sales and marketing processes are impacting your business. Do you know how long it takes on average for a deal in your pipeline to close? Curious whether your marketing campaign has resulted in a spike in the number of new contacts you gained over the last three months? Bring this information to the surface and organize it in easy-to-read visualizations such as bar charts, line graphs, and more, to gain deeper insights, discover trends, and easily share your findings with key stakeholders. Drill down to learn more about your progress toward specific sales, marketing, or growth goals. Need insight into how fast your sales pipeline is growing? Build a report that shows you the number of deals created during a specific date range, the exact date they were created, and their current status. You can also use Custom Reports to measure the performance of your sales and marketing teams, right down to individual team members. Want to see how many total deals a sales rep has won, lost, or currently has open? You can customize and save that report. When you’re equipped with the right information, you can make more informed decisions about your marketing and sales processes. We built Custom Reports to make it easier than ever to create, save, and share clear, customized reports that show you exactly what you need to know. The Custom Reports Beta is currently available for all customers on the Enterprise plan. Log in to your ActiveCampaign account, go to Reports, and select Custom Reports to start customizing your reports today. Stay tuned as we continue to add to our Custom Reports suite, with the ability to report on automations and campaigns coming soon!